Senior don't only age physically – they age mentally, too. Unfortunately, as our favorite furry friends reach their later years in life, their mental function can decline, just as ours can. Canine cognitive dysfunction, or CCD, is caused by chemical and physical changes that affect the brain function of older dogs. Like people with Alzheimer’s, CCD usually comes on slowly and gradually gets worse. Unfortunately, there is no known cause of this condition. 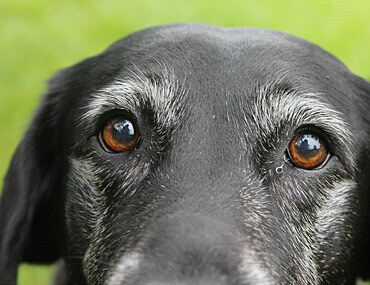 While some decline in mental function is expected in aging pets, some dogs seem more affected than others. Common symptoms of CCD can include disorientation, changes in your dog’s interaction with family members and other pets, changes in sleeping habits, and increased bathroom accidents. The most common complaints of family members whose dogs suffer from CCD are that the pooch wanders at night and forgets her housetraining. Zoetis, a pharmaceutical company that manufactures a medication to treat CCD, provides an excellent checklist to help you determine if your dog is showing signs of CCD. This checklist can be found at the CDS In Dogs website. Because CCD often affects older dogs, these screening tests are extra valuable because they can also help uncover other common conditions or diseases your older pet may have. Unfortunately, there is nothing you can do to prevent your dog’s mental decline associated with aging or cognitive dysfunction. Regular visits to your veterinarian and routine preventive care screening can help address any concerns early and find other reasons for behavior change.